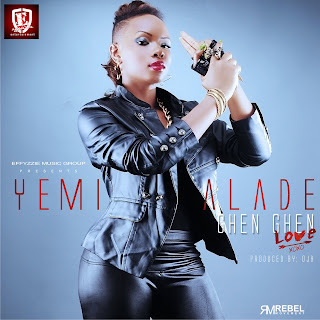 Rising Nigerian Pop star and singing sensation Yemi Alade returns with her brand new single titled “Ghen Ghen Love” which is superbly produced by veteran producer OJB Jezreel. Collaborating amazingly on record, Yemi Alade and OJB Jezreel have created one of the songs of 2012! “Ghen Ghen Love” is one hell of a monster record - an infectious bass-heavy Pop tune laced with lush synths and thumping drum patterns that will not only leave your heads bopping and your feet moving in the clubs but be prepared to have this single take over your radio waves in the coming weeks and months! “Ghen Ghen Love” is OUT NOW via Effyzzie Music Group. Born in Abia State to business woman, Helen Alade (Nee Uzoma) and Police officer, James Alade, fast-rising Nigerian Pop sensation Yemi Eberechi Alade was the fifth of seven siblings in a household that was filled with music from day one. Yemi - whose dual heritage of South-East Nigeria and South-West Nigeria earned her the moniker of “that Yoruba-Ibo girl” - grew up listening to popular music of the late eighties and early nineties and would showcase her singing and dancing dexterities as a child in several party and social competitions. She began singing in her Church choir at the tender age of twelve and was soon known to be able to make melodies from everyday conversations - in her own words, “I’ve practically lived my life on stage”. Yemi grew up in several Nigerian cities as a kid owing to her father’s job commitments and was educated at Saint Saviors’ British Primary School in Lagos before proceeding to Victory Grammar School, Lagos and then to the University Of Lagos where she majored and graduated with a Bachelors degree in Geography in 2010. Under the supervision of Bayo Omisore (2Face, Lami), Yemi began making music professionally in 2005 and would go on to win the maiden edition of the Peak Talent Show in 2009. Her debut single “Fimisile” which featured eLDee was released in 2010 and peaked remarkably with over ten thousand hits on YouTube in barely a month and features on several taste makers such as Bella Naija, Jaguda and Not Just OK among others. Currently hard at work on her yet to be titled debut album, she continues to make her mark in the African music industry - performing on hundreds of stages across Nigeria and featuring on massive singles with major artists such as Dipp, Ice Prince, eLDee, M.I, Sauce Kid, Shank, Sir Shina Peters, Waje, Wizkid and Yemi Sax to mention a few. Her extensive discography has also seen her working with veteran and burgeoning music producers like OJB “Jezreel”, eLDee, E. Kelly, IBK, MajorOne, SizzlePro, Red Bull Music Academy alumni DJ Klem, Bigfoot, Flip Tyce and World renowned South African producer Garth.